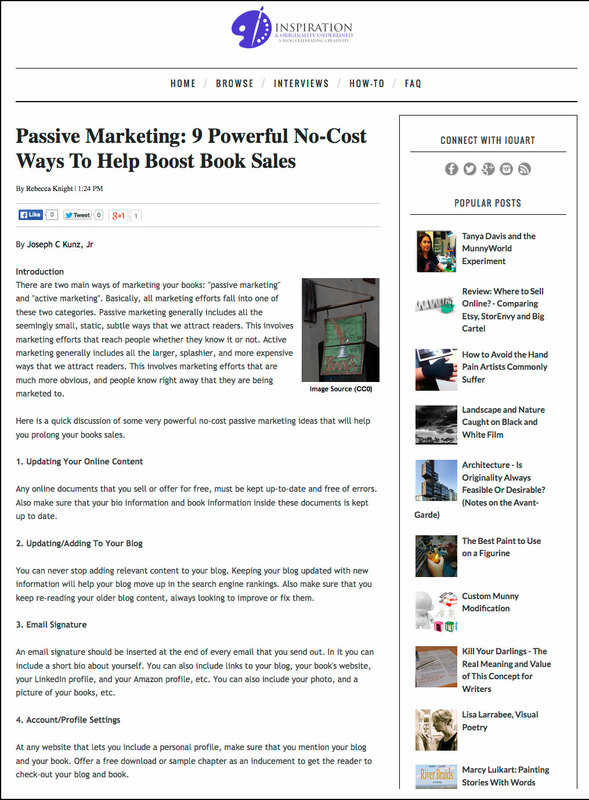 Here is a quick discussion of some very powerful no-cost “passive marketing” ideas that will help you achieve never-ending books sales. 1. 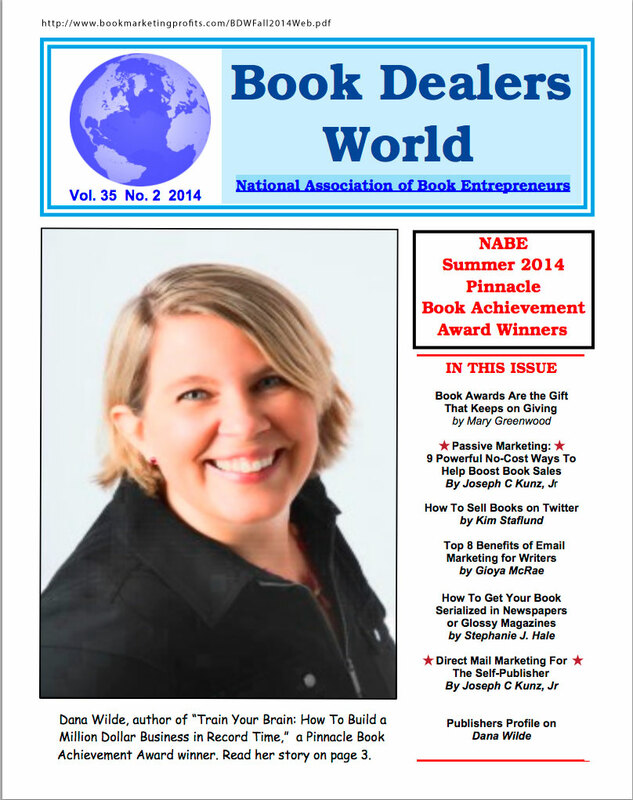 You will learn how and why passive marketing is so powerful and important for improving your book sales. 2. 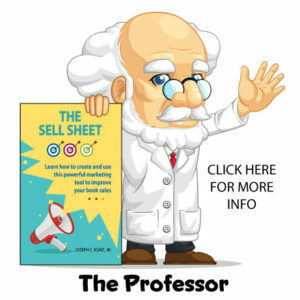 You will learn just how easy and inexpensive passive marketing can be to implement. 3. You will learn how important repetition of your marketing message is to your book’s long-term success. 1. Passive marketing generally includes all the seemingly small, static, less expensive or no-cost, and subtle ways that we get the attention of readers. This involves marketing efforts that reach people whether they realize it or not. 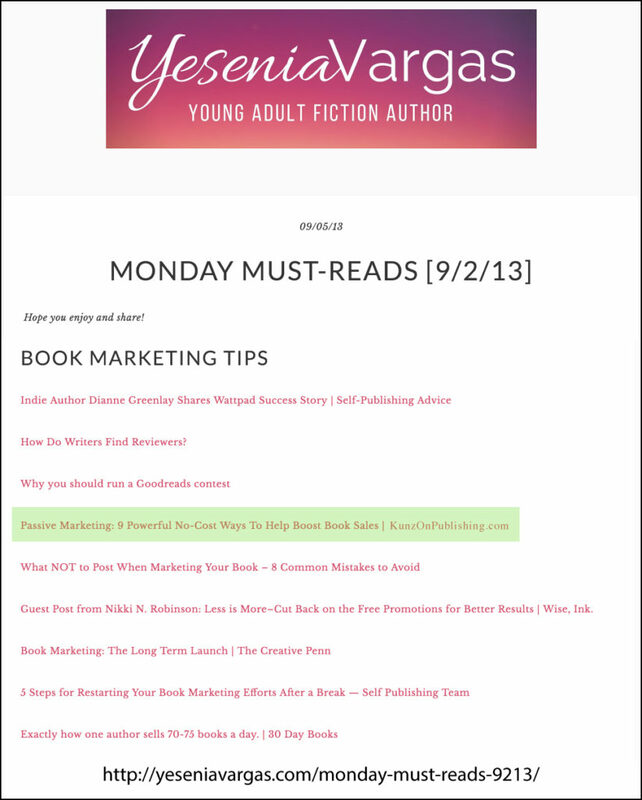 A blog with lots of free and informative information is a good example of passive marketing. Appearing on a television show as an expert is also a good example. 2. Active marketing generally includes all the larger, splashier, and more expensive ways that we get the attention of readers. This involves marketing efforts that are much more obvious, and people know right away that they are being marketed to. Paid advertisements in print and online is a good example of active marketing. Email marketing is also a good example. 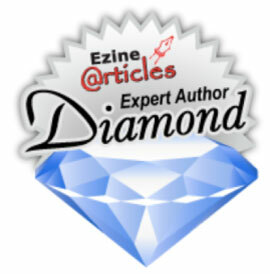 Thank you very much to author Yesenia Vargas for linking to my article. Any online documents that you sell or offer for free, must be kept up-to-date and free of errors. Also make sure that your bio information and book information inside these documents is kept up to date. You can never stop adding relevant content to your blog. Keeping your blog updated with new information will help your blog move up in the search engine rankings. Also make sure that you keep re-reading your older blog content, always looking to improve or fix them. Always fix or eliminate dead links. Dead links might hurt your Google ranking and search results, and they make you look lazy. 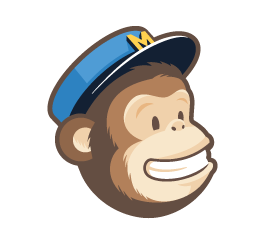 An email signature should be inserted at the end of every email that you send out. In it you can include a short bio about yourself. You can also include links to your blog, your book’s website, your LinkedIn profile, and your Amazon profile, etc. You can also include your photo, and a picture of your books, etc. At any website that lets you include a personal profile, make sure that you mention your blog and your book. 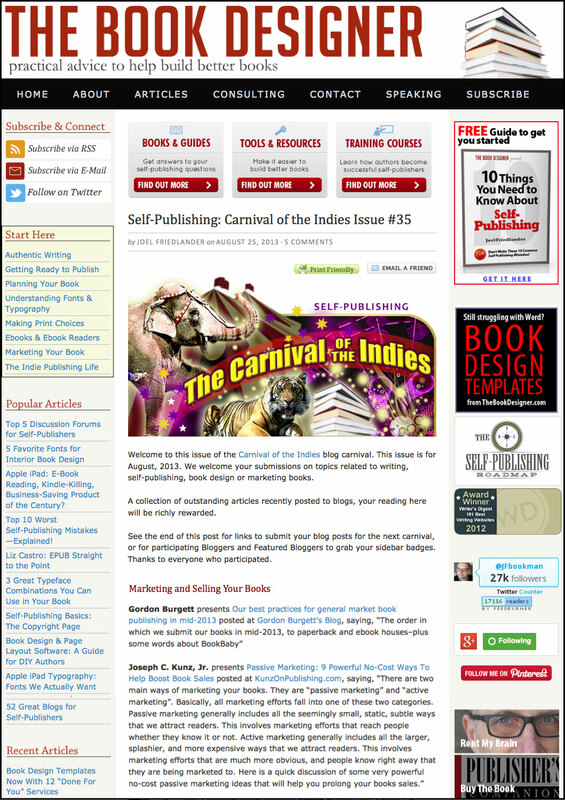 Offer a free download or sample chapter as an inducement to get the reader to check-out your blog and book. A new and updated cover can very quickly give your book a new life. If you are creative, and have a good eye, you can do this by yourself for free. But if you have a few hundred bucks, you should hire someone to do it for you. You must never stop improving the content of your book. Keep searching for grammar mistakes, spelling mistakes, and factual mistakes. Mistakes of any kind can hurt your reputation, your brand, and your credibility, in the eyes of your readers. 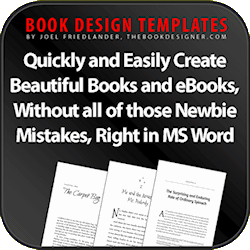 Get as many blurbs and quotes that you can get. 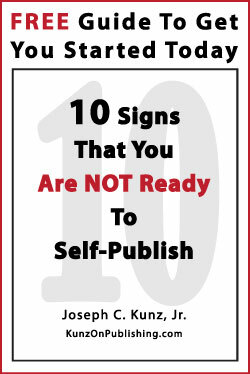 Never stop asking for them from your readers and other industry insiders. 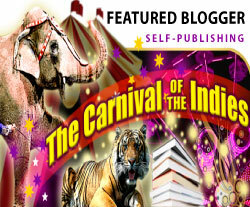 Make sure that you display the best ones on your blog and inside your book. Generally, you should not pay for book reviews. (Although, there are a few very legitimate review services that might be worth the money.) 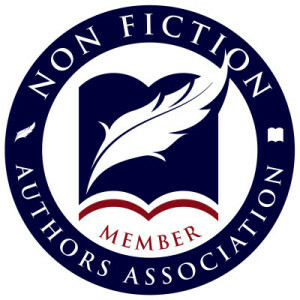 But, with some effort, you should be able to get your readers, and industry insiders, to review your book for free. 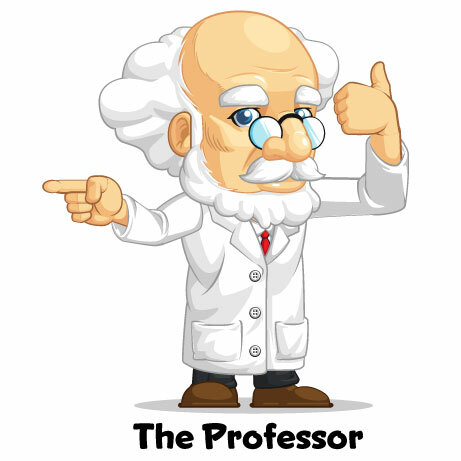 This simply means that you should mention your blogs and publications inside everything that you publish. If you give away, or sell, individual short stories, make sure that you mention your other short stories, or your book of short stories, or novel, at the end of each and every individual short story that you sell. Although all of these tips are simple and no-cost, they can be highly effective – especially over the long-term. This is because they can be seen over and over again all over the internet. Repetition is the key here. Every time someone sees your name on the internet, along with your blog’s name, and your book’s title, your brand builds a little bit more momentum and credibility. 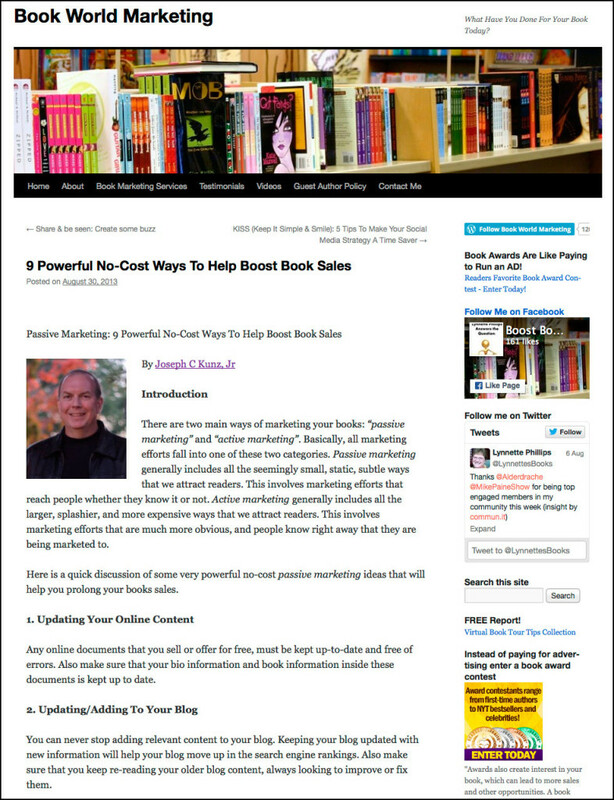 This will certainly help keep your book sales growing, even in times when your active marketing efforts slow down. 1. Have you utilized any of these passive marketing tools? Please share how and why you did this. 2. Please share which of these tips are your favorites. Did any of them help you re-think your marketing plan? This entry was posted in Blogging, Book Marketing, Book Reviews, Inbound Marketing, Marketing, Outbound Marketing, Passive Marketing, Podcast, Testimonial and tagged Blurb, Book Marketing, Book Reviews, Email signature, Inbound Marketing, Long Tail, Marketing, Outbound Marketing, Passive Marketing, Podcast, Quote, Testimonial. Bookmark the permalink.